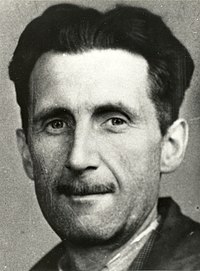 George Orwell (June 25, 1903 – January 21, 1950) was an English writer and professor. He is most famous for the novels Nineteen Eighty-Four and Animal Farm. Simple: All the lies and hate during a war, are usually said by the people who are not fighting. Simple: When I was young I saw that newspapers never tell the whole truth about an event. Simple: People are not scared at night because the army are ready to hurt the people who might want to hurt us. This page was last edited on 14 November 2009, at 08:32.